As Peter Capaldi is turning in his sonic screwdriver, wouldn't it be great if Catherine Tate, aka Donna, came back as the new Doctor? Then she definitely would be "Doctor Donna"! 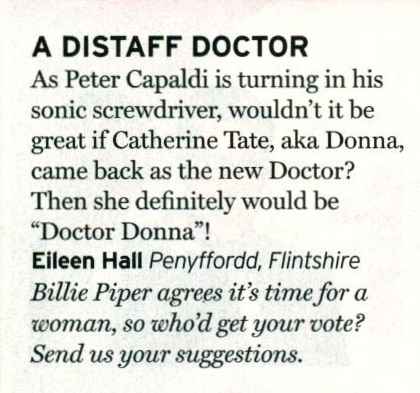 Billie Piper agrees it's time for a woman, so who'd get your vote? Send us your suggestions. APA 6th ed. : (2017-02-11). A Distaff Doctor. Radio Times p. 166. MLA 7th ed. : "A Distaff Doctor." Radio Times [add city] 2017-02-11, 166. Print. Turabian: "A Distaff Doctor." Radio Times, 2017-02-11, section, 166 edition. This page was last modified on 5 March 2018, at 01:58.